Multitasker Tools – Setting the bar on AR platform field tools? Here at TPF we’ve had the pleasure to review a pair of tools built primarily for the AR-15 platform. The TUBE and the Ultralight have been reviewed prior, and showcase some of the quality and design excellence which has become expected by Shane Keng and his Company, Multitasker Tools. Here is the rub however, the tool that is featured in this installment of TPF is not the newest design released by Mr. Keng, it is however the tool which launched Multitasker into becoming so well known for it’s platform specific tools. 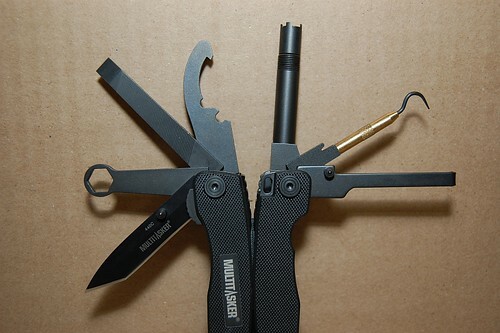 Enter Multitasker’s Multitasker Series 2, AR platform field multi-tool. The Series 2 has some changes over the initial build of the Multitasker, which are mainly in regards to tool location and the addition of the now common #8-32 Male thread for OTIS cleaning attachments and the ever present cleaning pick. Unlike many other companies, Multitasker has made it a priority to improve upon their tools and take into account critiques and suggestions for improving their products. The Multitasker reviewed by TPF is in fact a later Series 2 model noted by an alterations to the plier jaws that improved cutting ability and the jaws themselves were upgraded with a roller bearing joint for smooth operation. 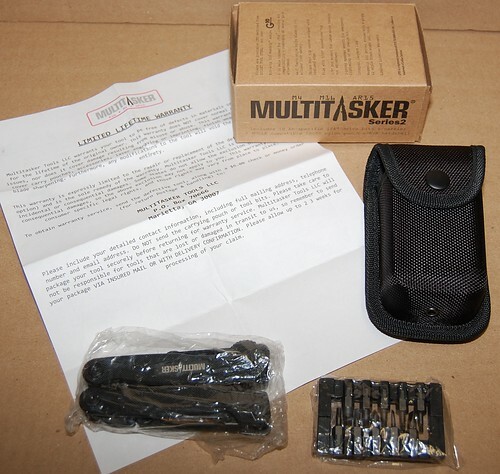 The Multitasker is similar in construction to the other quality tools manufactured under the Multitasker brand. All metal components contained in this tool are machined parts with only the Springs and plier-stops being the exception. From scraper to screwdriver the whole mutli-tool is made from stainless steel which is treated with a black oxide finish. The liners, tool arms and springs are manufactured from 420 stainless steel where as the knife blade is 440C stainless steel. The main jaws are precision machined from D2 tool steel and the attention to detail is evident by the nearly seamless nesting of the teeth when the jaws are closed. With the outer handles covered by extremely durable G-10 fiberglass panels, the grip on the Multitasker is very good in form fit and function. 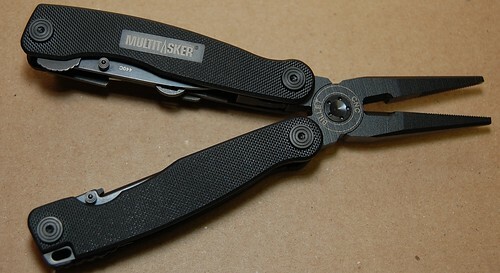 All seven tool arms contained in the Multitasker handles. There are a total of seven tool arms on the MultiTasker Series 2, AR15/M4/m16 specific platform tool. All tool arms are made to have the position/resistance springs retain the arms in a closed or open position. Tool #1- The first tool is the versatile and effective Tanto styled blade which has a thumb stud for one handed opening and is the only “tool arm” which has a liner locking mechanism to secure the blade in the open position. Tool #2- The Larue wrench. 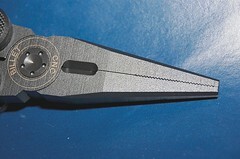 A 3/8″ hex wrench for tightening nuts on the very popular Larue Tactical scope mounting components. Tool #3- The Screwdriver/File tool arm. A large flat blade screwdriver with good thickness for any sort of torquing operation and a combined file for some additional versatility. The sharp edges of this tool allow it to double as a carbon scraper for larger surfaces. 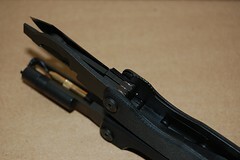 Tool #4- A Castle Nut Wrench for cinching up loose stocks on Carbine/collapsing stocks. Multitasker does warn that the tool is not for assembly and proper torquing, but field fixes. Tool #5- The 1/4″ hex magnetic bit driver. Originated in the Multitasker and carried over into both the in the TUBE and the Ultralight, it is one of the most acclaimed features of Multitasker’s tools. As always the driver comes with the 4 prong A2 front sight adjusting bit installed. Tool #6- OTIS attachment arm. With the robust and very effective cleaning pick installed, the arm sports a male #8-32 thread enables owners to connect many OTIS attachments and use the Multitasker as a cleaning handle. As with the bit driver, this attachment feature and pick is carried into the other previously mentioned Multitasker tools. 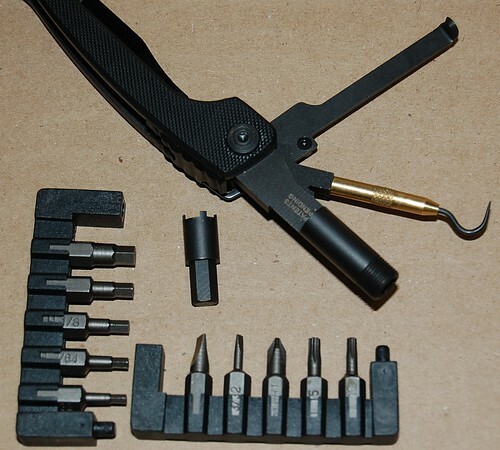 Tool#7- Form fitting carbon scraper for cleaning the bolt of the AR15/M4/M16 platform. With the tip made with the same radius as found on the bolt, the carbon scraper allows for simple and efficient cleaning. Also with a thumb stud for opening ease, this scraper is another common feature across this line of platform specific tools, albeit slightly differently mounted on the tube. The pliers themselves are very durable and incorporate a roller bearing for flawless functionality. As discussed earlier, the jaws are CNC machined from a single billet of D2 tool steel which allows for nearly seamless tooth interaction. In addition, the pliers are mounted very securely and allow for considerable pressure to be exerted through the jaws. The cutting surfaces of the jaws are also sculpted to allow for a great effectiveness on a variety of wire types and construction. You will not find any forged pieces or weight relieving cuts which would otherwise reduce the strength of the jaws themselves. This was a mandate by Mr. Keng and his designs; No sacrifices to quality and performance in order to save costs and mass. Of lesser notation, but still of importance, are the small attentions to details that are shown in the excellent material selection and quality. Machined brass washers between the tool arms for a perfect mating and for durability and survivability. The usage of fiberglass comprised G-10 covers on the handles for durability, resistance to chemicals and general wear are typical of the designs produced by Multitasker. A small ring for attaching a lanyard is also incorporated into one of the tool’s handles. 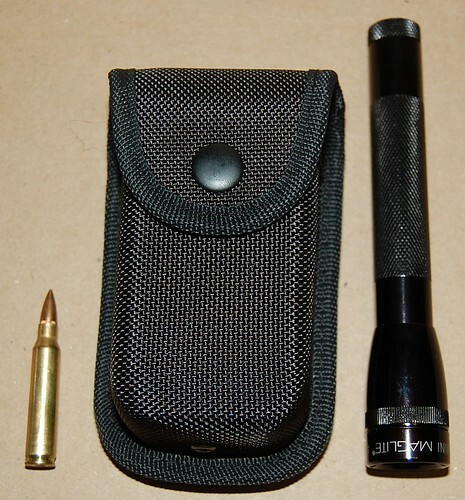 The Multitasker Series 2 comes with a Molle compatible nylon pouch which has a compartment for holding the additional ten (10) driver bits. 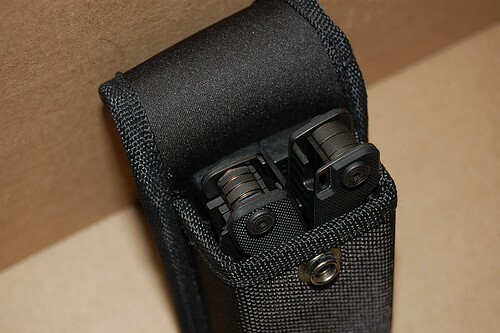 The black, 1000 denier nylon pouch is very rigid and has a strong snap clasp for holding the flap closed and retaining the Multitasker when stowed away. The overall size of the Series 2 Multitasker is fairly large and it is not a lightweight in the mass department. 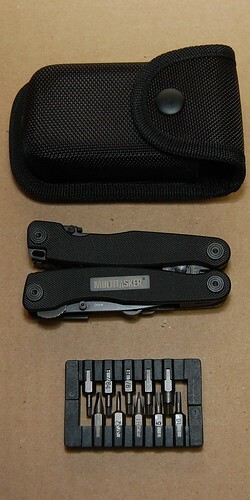 However, the Multitasker Series 2 multi-tool is not meant to be used for EDC. It is firearm specific and aside from the utilitarian knife blade, is designed to be a miniature armorer’s kit for the AR15/M4/M16 platform. This entry was posted on July 13, 2011 by M. Duynhoven. It was filed under Blades and tools and was tagged with AR Platform, AR-15, multi-tool, Multitasker.